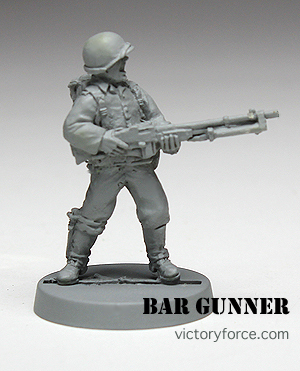 This BAR Gunner yells as he holds the trigger on his Browning Automatic Rifle spraying deadly fire. On his leg is strapped a bayonet and on his back his pack. You can just imagine the his arms straining as the gun bucks from each round leaving the barrel. You can find him with or without pack in the US Infantry WWII Section of the Victory Store. He is one of over 1000 figures available in the Victory Store. This entry was posted in Spotlight and tagged 28mm, figures, miniatures, spotlight, US, WWII. Bookmark the permalink.